The critic must have two things: personality and an ax to grind. In his review of Todd Haynes’ I’m Not There (2007) in The Nation – an American magazine of political commentary that has been stirring up its readers since 1865 – Kent Jones blasts off. Jones never writes about just the movies; he draws buckets of insight from deep wells of cultural, social and cinematic history, directs his gaze with surgical precision and bewitches the reader with revelations that whet the appetite. Instead of creating distance between us and him – and between us and the topic at hand – he reels us in. We’re giddily hooked, lined and sinkered, even if we disagree and want to pull him into the pond by the same line whose hook is lodged neatly in our cheek. As an editor of mine once said, “Now that’s a lead” (“lede” in newspaper lingo). We want to call a time-out so we can catch up with Jones and check our favourite resources on Hollywood studio history, recent American politics, maybe a film or two we haven’t seen or a director whose name we recall from that film course that wasn’t all that good, so this might be a good time to do our own sniffing around, and what’s that about Christ and Icarus? Make that two time-outs, a Hail Mary and a whiff of oxygen for good measure. Welcome to the world of Kent Jones, film critic, thinker, asker of questions and taker of a film culture’s temperature and blood pressure. He’s a Maddinesque mad scientist keenly watching the film world’s double helixes twist in the breeze and richly reporting on the meaning of every nucleotide of cinematic DNA. Jones is editor-at-large at Film Comment, published bimonthly by the Film Society of Lincoln Center, where he is also associate director of programming and a permanent member of the selection committee for the New York Film Festival. The dust jacket on his first book, Physical Evidence: Selected Film Criticism, tells us that he is also at work on a film about Elia Kazan with a director whose name you might have seen: Martin Scorsese. Jones’ documentary, Val Lewton: The Man in the Shadows (2007), premiered in December at the Film Society and was released by Warner Home Video DVD on 29 January (3). That cable television haven for all things cinematic, Turner Classic Movies, aired it on 14 January. Jones’ book is divided into five parts: “Directors”, “Films”, “‘Think Pieces’”, “Out of the Fog”, and “Two Critics”. In the last, he pays tribute to two veterans of film writing: Andrew Sarris (b. 1928), film critic for The New York Observer, whom Jones calls the Jonathan Edwards of film criticism (p. 198), and Manny Farber (b. 1917), who wrote for The New Republic, Time, The Nation and many other publications. These strongly-felt pieces convey Jones’ deep sense of gratitude to the masters but lack the strongest and most entertaining arrow in his writing quiver: his lists. They’re everywhere. Long ones, short ones, lists of words, phrases, concepts and observations. They occur within sentences and form sentences within paragraphs. They have sweep one moment and the jolt of a jackhammer the next. They help give Jones’ writing its texture and arm his critical thinking with the heft born of a life at the movies. With the care that comes when you’re not writing against the daily deadlines of newspaper movie reviewing, and a ferocious sense of clarity, Jones helps us see how movies and directors work. Jones is first a keen observer, accustomed to looking at films through both ends of the binoculars, a microscope if needed, and with his own eyes from the highest vantage point. His critical lens tracks, zooms, pans and freezes the frame with the eye of a cinematographer. As a former speechwriter, I marvel at the sense of rhythm, parallelism and sheer musicality of this passage. But there’s more than music and pleasing rhythms here. Jones’ writing, lists included, embraces as much knowledge, wisdom and wit as it imparts. We see the movies with him. His insights range from the sprawling to the tidy. In his introduction to Physical Evidence, Jones laments the grabbed-by-the-throat-mentality, the “yes or no” (p. xii), up or down thinking in much of the reaction to movies in the last ten years – the period in which most of the essays were written. What Jones argues for is a sensibility that is alert enough to be won, not bowled over; to be seduced, not raped; and convinced, not bullied, by filmmakers and their work that may rub us the wrong way. “Claire Denis once said that a filmmaker, and by extension, any artist, must always be fighting against something.” (p. xvi) This is Jones’ mantra as well. Jones ends his book with the source material for his own cinematic and critical DNA, Andrew Sarris and Manny Farber. He cherishes Farber’s “ecstatically engaged, bracingly immediate history of the cinema.” (p. 212) He embraces Sarris’ “disarming honesty and his complete lack of concern with being hip.” (p. 202) These characteristics illuminate Jones’ own writing, and personify a film critic who is refreshing in his directness; he actually says he “likes” John Huston and William Wellman more than Sarris does (p. 206). Jones is not afraid to get as close to a film or a director as Cary Grant was to Ingrid Bergman in the balcony scene near the beginning of Notorious (Alfred Hitchcock, 1946) and he knows when to pull his lens far enough away to get the biggest, widest shot (think Terrence Malick in Days of Heaven ). Few American critics writing today help us see so clearly the movies that enchant us, the directors who make them, the actors who enspirit them, and how the movies stir an uncertain, demanding audience. 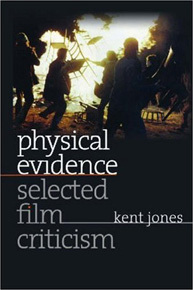 Physical Evidence: Selected Film Criticism, by Kent Jones, Wesleyan University Press, Middletown, CT, 2007. Kent Jones, “Chaos, Clocks, Juxtapositions”, The Nation, 24 December 2007. The full title of the DVD release of Jones’ documentary is Martin Scorsese Presents Val Lewton – The Man in the Shadows.